This story appears in the Dec. 15, 2014, issue of Sports Illustrated. Subscribe to the magazine here. The sports therapy center sits adjacent to Gillette Stadium, 500 feet to the northwest, inside a shopping plaza, next to a hair salon. It's a nondescript location but no ordinary rehab facility. There's a VIP entrance, a personal chef and a brain fitness room. The company logo is splashed everywhere: tb12. It's a November Monday morning in Foxborough, Mass., and the center's owner, Patriots quarterback Tom Brady, has already received treatment and spoken to his neuropsychologist via Skype. 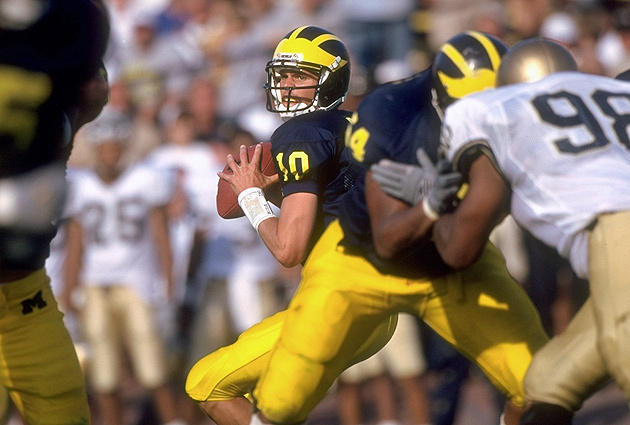 The day before, he obliterated the Lions, topping 300 passing yards for the 63rd time, tying Dan Marino for No. 3 on that list. Perhaps he celebrated with ice cream, though his would have been made from raw ingredients, mostly vegetables -- he favors an avocado base with cacao mixed in to mimic chocolate. "Tastes great," Brady says later, not all that convincingly. The flat screen in the lobby is tuned to SportsCenter; next to it are jars of whey protein and knee braces for sale. Brady is away at the stadium, deep into his routines by now. Forget, for the moment, the supermodel wife, the movie cameos, the designer clothes. That's celebrity camouflage. That's Brady and that's not Brady -- not as it relates to football. His career is built on, defined by and prolonged with routine, even if his life is anything but that. This scrolls across ESPN's ticker: 7 STRAIGHT FOR BRADY, PATRIOTS. The center is run by a 49-year-old California native with a master's degree in traditional Chinese medicine. Teammates describe Alex Guerrero as Brady's Mr. Miyagi. They say he knows the quarterback's body better than Gisele Bündchen, Brady's wife. "I do have my hands on him a little more than she does," Guerrero says, laughing. He is Brady's body coach and business partner, and he's one of the main reasons Brady has been able to transform what looked like a lost season into another star turn in a Hall of Fame career. In late September, after a 27-point drubbing by the Chiefs, the more foolish NFL observers suggested that Brady could be near the end. That he should retire. Instead, he's on track for the fourth-best passer rating (100.2) and the third-best interception percentage (1.4%) of his career, with what one might fairly describe as one of the least intimidating sets of wide receivers he's ever had. And how he did that -- with a diet that made him lighter, workouts that made him (relatively) faster and marked improvement in throwing on the run -- speaks directly to his work with Guerrero, and to the center they opened together more than a year ago. It has the Patriots 10-3 and Brady positioned to make another run at the Lombardi Trophy, which has eluded him since 2005. The two men met through Willie McGinest, the linebacker who played 15 seasons with Guerrero's help. Initially, Guerrero fixed Brady's aching right shoulder. Then it was a sore calf and a damaged groin. Other than one freak injury, a torn left ACL in '08, Brady has not missed any time since he started with Guerrero, about 10 years ago. He is 37 and in his 15th season, and he wants to play into his 40s. Like 45. Like 48. When teammates ask how long, he simply says, "Forever." "You'll hear people say, Football doesn't define me," says Guerrero. But that's not Brady. "Football isn't what Tom does -- football is Tom. This is who he is." Let’s start here: Brady is a quarterback whose daily schedule, both in and out of season, is mapped clearly into his 40s. Every day of it, micromanaged. Treatment. Workouts. Food. Recovery. Practice. Rest. And those schedules aren't just for this week, this month, this season. They're for three years. That allows Brady and Guerrero to work in both the short and long terms to, say, increase muscle mass one year and focus on pliability the next. "The whole idea is to program his body to do what we want it to do," says Guerrero. "We don't let the body dictate to us. We dictate." "God, what if LeBron James trained how I trained?" Brady asks. "He really could play forever." Sports accelerate the aging process, especially football, which often leaves gladiators, once powerful and sculpted, with shredded ligaments, broken bones and scrambled brains. Yet quarterbacks seem to age more slowly than other players. Based on touchdown passes, nine of the top 10 signal-callers this year are 30 or older; six are at least 33. For Brady to play this well for so long isn't simply a matter of built-in aggression (although he has that) or extra film study (although he does that) or of avoiding big hits and running only when necessary. The secret to his longevity is more encompassing. "Everything," says Guerrero, "is calculated." Guerrero describes a typical vacation day, in the offseason: Brady wakes up, works out, has breakfast with Gisele and their two kids, hangs at the beach, naps on schedule, surfs, works out again. He goes to sleep early, eats well and for the most part avoids alcohol. The in-season portion of his regimen is designed to run through Super Bowl Sunday; if New England's campaign ends in a playoff loss (excluding that 2008 season, he has missed the postseason just once), Brady completes every drill, every throw, anyway. That's their system. From the outset the principles made sense to Brady, who had spent the early part of his career like most athletes. He'd worried about injuries after they happened. He'd focused on rehabilitation as opposed to preventative maintenance. He was, he says, guiding a plane 30,000 feet into the air without having prepared for mechanical trouble. He would stick his elbow into an ice bucket after training sessions because that's what people did. "It's systematic," Brady says. "I was part of that system. You're in it for so long, you're fearful of change. You always got in the cold tub, so you continue to." Guerrero challenged all of those notions. He showed Brady how the muscles in his forearm had, through lifting weights, become short and stiff and how that led to soreness when he threw. Together they worked to make those muscles longer and more flexible -- "more like rubber bands," says Brady, "so I can throw thousands of footballs and not worry." In essence, after the ACL recovery, Brady placed Guerrero in charge of the second half of his career. "God, what if LeBron James got what I got? What if he trained how I trained?" Brady asks. "He really could play forever." A Brady story: Charity football game for disabled children, circa 2009. Brady's charity. He's the quarterback. Fourth quarter comes, and he implores his teammates -- guys like retired tight end Christian Fauria -- to pick up the pace. Gotta catch that! Finish the route! So Fauria runs harder, pulls a hamstring and looks at Brady. "Calm the f--- down," he says. "You're the quarterback for both teams." Brady can eat all the vegetable ice cream he wants, but what drives him, what pushes him to play forever, existed long before. Brady is new age in approach but old school in composition. "I played with a bunch of quarterbacks: Kurt Warner. Marc Bulger," a former teammate says. 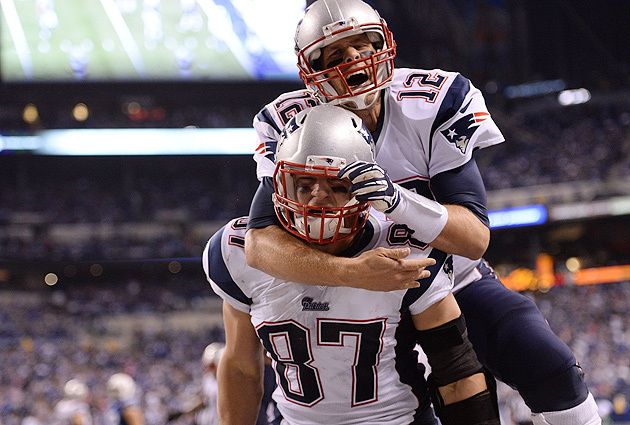 "They didn't match Tom's intensity. Not even close." He's competitive, but to state it that plainly diminishes the level of obsession he has to win. Like in 2005, when a vicious hit to his left shin in Week 14 against the Bills left Brady unable to walk. He played the next week, against the Buccaneers, and suffered a sports hernia that left his testicles at least three times their normal size. He played four more games, including the playoffs, with a bad shin and awful swelling down below. His backup at the time, Matt Cassel, tells this story, setting up the easiest of punch lines. "So, yeah," he says, "Tom Brady has big balls." Brady has refused to cede any reps in practice, even handoffs. He told Cassel and Brian Hoyer (a Patriot from 2009 to '11), "That's how I got my job." When Rodney Harrison played with Brady, the safety showed up at 6:40 a.m. to lift weights. "Good afternoon," Brady said to him. So the next day Harrison showed up at 6:30. "Good afternoon." Then 6:20. Then 6:10. Then 6. "Good afternoon" each time, until Harrison finally said, "Screw you, Tom. I'm not coming in any earlier." "I only played one year with him," says tight end Cam Cleeland, a Patriot in 2002. "I still remember his paddle from camp." He means Brady's table-tennis paddle, the one chipped and frayed around the edges, broken from abuse. "I played with a bunch of quarterbacks: Kurt Warner. Marc Bulger. They didn't match Tom's intensity. Not even close." Brady’s throwing coach, Tom House, once tutored Nolan Ryan, the Hall of Fame righthander. Ryan was 42 when he started working with House, back when the ace said he wanted to pitch another year or two. He didn't retire until he was 46. House operates within what he calls four "windows of trainability." The first two windows focus on developing athleticism as young players (from age six through the late teens) learn sports and gain strength. The third window, which lasts through the late 20s, is for skill acquisition. Everything thereafter -- the fourth window -- is skill retention, skill maintenance. That's when athletes can slow the aging process. Or try to. 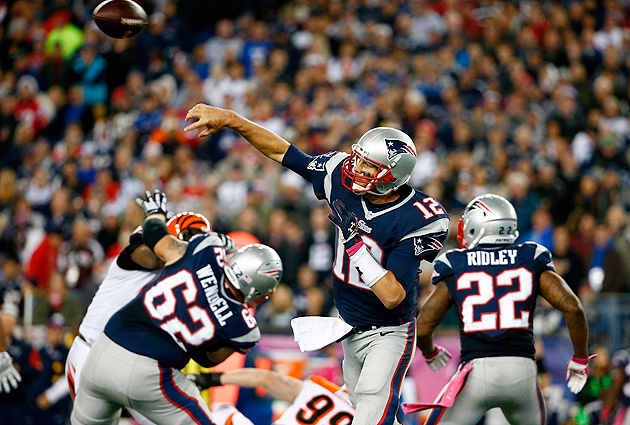 House and Brady work to refine less than 2 percent of the QB's overall skillset. That's it. The upper end of the upper end. Early on they ran Brady's throws through a three-dimensional motion analysis, studying his movement patterns (length of stride), timing (shoulder and hip separation) and the mechanical variables (eye level, release point). That provided a baseline. After Brady's subpar 2013 season -- subpar by his standards, anyway -- they looked at ground-force production: how to shift his feet more quickly to create more torque and to boost his spin on shorter throws and his distance on longer ones. One exercise they added, the Fogel drill, forces Brady to shuffle his feet for 30 seconds while simulating throws to dozens of targets. This makes Brady plant and pass faster. It has helped his balance and led to gains, even at 37, in his ability to deliver on the move. "Tom is pushing back the aging process," says House. "There's no reason he can't do at 45 what he did at 25." Brady started with House two years ago, shortly after the death of Tom Martinez, the quarterback guru who developed his mechanics in the first place. For years Brady carried a page of notes from Martinez in his wallet. He eventually transferred those reminders -- hips closed, elbow high -- to his BlackBerry. When Martinez died in 2012, after years of kidney and other ailments, Guerrero says it had a "spiritual impact" on Brady. Hold up. Spiritual? Has anyone ever described Brady that way? "Our method relates to being physically fit, emotionally stable and spiritually nourished," says Guerrero. "Emotional stability allows you to have spiritual awareness. I always tell him and Gisele they're the most spiritual nonreligious people I know." There's something else that Guerrero and Brady remind each other of all the time, a philosophy of sorts. It could also be interpreted as spiritual. Like Brady, Tim Hasselbeck entered the NFL as a quarterback in 2000. At the combine that year he watched video of Brady, saw him with his shirt off, the 40-yard dash that started in slow motion. "Nothing special," he thought. "Pretty standard." Hasselbeck went undrafted out of Boston College, played overseas and bounced around the NFL before becoming an ESPN analyst. Brady? He won his first 10 playoff games. He hoisted three Super Bowl trophies in his first four seasons as a starter and was named MVP in two of those games. He was league MVP twice, in 2007 and '10. Obviously not "pretty standard." "This guy is year-round," Brady's trainer says. "No plays off. No days off. Everything is purposeful." And yet the career arc hasn't been perfect. Since that hot start Brady is 8-8 in the postseason, including two losses in the Super Bowl to the underdog Giants and two to his greatest rival, Peyton Manning, in AFC title games. The back end of his career has been defined, in many ways, by his ability to win without continuity among his offensive personnel (when Pro Bowl guard Logan Mankins was traded in August, it was accepted as the Patriots Way) and, largely, without star receivers (outside of Wes Welker, his wideouts have had a combined two Pro Bowl nods). His wife alluded to the latter in 2012 when, after the second Super Bowl loss to New York, she responded to a heckler with, "My husband cannot f------ throw the ball and catch the ball at the same time." "What he's been able to accomplish there is nuts," says retired fullback Heath Evans, a former teammate turned NFL Network analyst. "There are always new linemen, new receivers, new position coaches. Change is constant." Except change is only one constant for the Patriots. Brady is another. Coach Bill Belichick is a third. The fourth constant is success: In an era where, Brady notes, "everyone is meant to be equal," New England has had 14 straight winning seasons, the third-longest streak of the modern era. Those who associate Brady only with the rotating cast that he throws to or that blocks for him miss an important point. His support system -- his parents, his three sisters, his various personal coaches -- has remained consistent. "They're almost like his glam squad for football," says Fauria. Same team. Same coach. "Invaluable," says Brady. "For us, too," says the Pats' owner, Robert Kraft. "He's like my fifth son." The week after the Patriots fell to the Ravens in the 2013 AFC Championship Game, Brady showed up for workouts with his trainer, Gunnar Peterson, a Band-Aid still on his arm from some game scrape. "This guy is year-round," says Peterson, who has worked with the likes of Sylvester Stallone and Bruce Willis, and who took on Brady after the ACL tear. "No wasted movement. No plays off. No days off. Everything is purposeful. And that includes the people around him." Balance in all things, as Brady says. He has countered that fire with lighter moments that have made him more relatable to teammates who made less money (or didn't marry supermodels, which is basically everyone). He didn't just gift his offensive linemen Uggs boots, he gifted everyone on the team. He didn't just watch pranks and laugh. He engaged in them. He won them. He used to sit by the door to the quarterbacks' meeting room and knock Cassel's food out of his hands when he entered. The backup responded by filling Brady's Nikes with a chocolate protein shake. Brady then had the tires taken off Cassel's car, putting three of them in his locker and hiding the fourth -- at which point Belichick put a stop to what he called World War III. But Cassel had learned two valuable lessons. The first: Brady can be one of the boys. The second: Don't mess with guys who make more money than you. Evans describes Brady as the "most humble superstar I've ever been around," and if that sounds convenient, he isn't saying that about Drew Brees or Shaun Alexander, superstar former teammates who happen to be two of his better friends. Brady's preparation, how he works, bolsters the way his teammates view him. He was maniacal. Still is. He meets with Belichick three times a week to talk over the gameplan -- every coverage, every hot read, every play. He summons his backups an hour before the Saturday team meetings and goes over the entire call sheet, typically between 100 and 110 plays. Twice. He asks the QBs to arrive an hour early on gameday, too, then goes over everything again. Twice. "He has a great memory from all that," says Bill O'Brien, once Brady's offensive coordinator, now the coach of the Texans. "He can remember from eight years ago: left hash, toward the lighthouse, third play of the game. ... We'll look it up. He's always right." If every player is competitive, and most quarterbacks are meticulous, here's what makes Brady different: that approach, where traditional Chinese philosophy and advanced sports medicine meet a quarterback willing to try anything in order to play forever. The avocado ice cream approach to football, basically. Take that diet. It's seasonal, which means he eats certain things in the winter that are considered "hot property" foods, like red meat. In the summer, when it's time for "cold property" foods, his diet is mostly raw. He subscribes to the 80-20 theory -- but it's not 80 percent healthy food, 20 percent unhealthy. It's 80 percent alkaline, 20 percent acidic. The idea, he says, is "to maintain balance and harmony through my metabolic system." That's why teammates always see him with hummus, raw snack bars packed with nutrients and what one teammate calls "that birdseed s---." This is the same guy who once ate Christmas breakfast with the Evans family and quietly picked all the sausage out from his omelet. Brady is faster and stronger. "But given where I started," he says, "I wouldn't say that's some great accomplishment." Take his sleep patterns. Brady struggles to unwind after games and practices. He's still processing, thinking about what's next. So they added cognitive exercises at night to destimulate his brain, allowing him to get to sleep by 9 p.m. and wake up without an alarm. Take his workouts. Brady does them on land, in sand, in water. He hardly ever lifts weights but works mainly with resistance bands. Then there's the brain resiliency program. Brady underwent a battery of tests and a neuroscan a few years back, then had a program created to work out his brain the way he worked out his body. The various exercises help Brady to more quickly process information between plays, read defenses and make adjustments. They assist with his memory. They increase his peripheral vision and how far he can see downfield. "The body is a whole system," says Brady, "and that includes the brain. I'm lucky I haven't had many concussions -- maybe one I can remember. I'm training for if that happens. I'm building resiliency and staying sharp. I feel like that's really where my edge is." "If we can keep his processing speed this high," says Guerrero, "then I don't care if he's 48." The by-product of all this: Brady is faster and stronger than on the day he was drafted. He doesn't care if you believe that. "I am," he says. "I'm more durable, too. But given where I started, I wouldn't say that like it's some great accomplishment." Brady is on the phone. It's Tuesday morning, two days after the Patriots lost 26-21 in Green Bay. The streak is over. The playoffs loom, the top seed in the AFC is within reach. Brady and Guerrero have already gotten in a workout. Back to the routines. The closer he gets to 40, the more Brady tries to simplify, the more he relies on his routines. He doesn't have many hobbies. He likes to surf, but he's terrible at it. He likes to golf, but he forced himself in recent years to take it less seriously, which made it less fun. Hoyer watched Brady against the Packers, and he points to all the f-bombs captured on camera, the way he head-butted Rob Gronkowski, how much every play still meant. "Since I met him, he married a supermodel, made millions of dollars and became internationally famous," says Troy Brown, another former teammate. "But I don't think he's changed that much." Well, maybe a little. Brady is active on Facebook now, a new development. He recently posted his old résumé; under additional, he'd written, "Guided football team as starting quarterback to 1998 Big Ten Championship." He posted pictures of former backup Ryan Mallett carrying his pads. He still wants to play forever, but he's come to realize that what has enabled him to play at such a high level for so long is what he wants to do after football too. That's why he opened his sports rehab center just over a year ago, why he recruited so many teammates to come by. (About half of them have, which perhaps has contributed to New England's improved roster health this season.) He still remembers the doctor who told him his knee would never be the same after the ACL tear, that he wouldn't be able to run around with his kids. "Which was all bulls---," he says. "That knee feels as good as my other knee." He won't need a résumé for his next endeavor, only his body of work and his actual body, how it has held up over time. "I used to joke with Alex," says Brady, "one day, we have to go on the road. We have to teach people. This is what people really need to know." He is presented with a scenario: Brady and his body coach/business partner on stage at some convention hall, dressed in white robes, packed crowd, merchandise tent, clothing and videos for sale, books jammed with testimonials for the quarterback turned life coach. "I don't know about the robes," Brady says, laughing, "but we do talk about it."